Few weeks ago I saw johnnyJ was selling his tank setup and after thinking it over I decided to upgrade so my fish would have more swimming room. Thanks to my friend Ernie, he made this move easy for me by driving to pick up the tank and helping me setup. 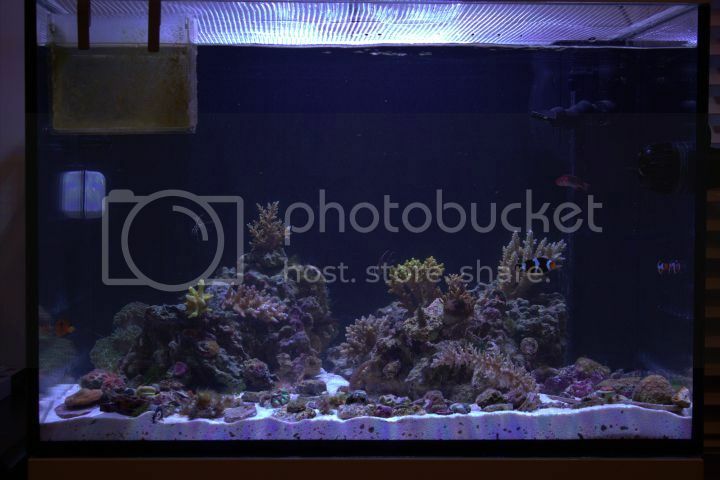 Tank: Elos 70 tank, stand, sump. Powerhead: I have 2 mp10wes on my tank right now. I have a 3rd one and i'm debating on ataching it or selling it. Will see depending on tank. I plan on going mostly sps with this build. I do have some hair algae i'm trying to fight at the moment and hopefully will be able to eradicate it in this tank soon. Will be pouring peroxide straight on the algae in hopes of killing it. - Pair of wyoming whites temporarily. - My electric blue hermit i've had since my first tank setup in 2007. This guy refuses to die no matter how much he's been through. - Few acros I picked up from max reef's aussie shipment along with a few others that i've had since they were 1/2-1"
- Lost Everyone of my chalices a few months ago except for the second chalice I ever purchased due to what I believe is bacteria from a bad order. - A little bit of lps here and there. Here's a FTS I just took to start documenting. Addicted to Corals.. I have CORALITIS, I need more CORALS! Awesome, this tank looks great. Very nice. Come get some frags so you can fill it up. Last edited by jf2381; 03-20-2013 at 07:35 PM..
Nice tank bro,any pics of the onyx? They must be like 2.75"by now. Nice ! I have an Elos 70 with Radions also. Its about a year old. What settings do you have your Radions at. I have a mixed reef with SPS and LPS. Running 20k at 70% and growing ! Good luck, its a nice size tank. Thanks guys. I'm happy with the layout. Seems so much larger than my midi and I went shallow rock landscape to give the upper more swimming room for my fish. Al, the onyx I have is about the same size as my picasso. Probably about 2" He caught up fast to my picasso and is about the same size. Sandy I use the settings john posted on the radion forum. I'm pretty happy with it. Need to adjust the intensity soon. Hopefully one is enough for now since I'll have sps more towards the middle and lower light corals in the front and sides. You're totally bonkers man. 3 Elos tanks now?